The HP Laserjet 3020 is a multifunctional black and white printer with copying, printing and scanning capabilities. Utilizing the laser technology, it is a basic all-in-one monochrome printer. The printer has the printing resolution of up to 1200 x 1200 dpi. With a monthly duty cycle of 7,000 impressions, it is specially designed to meet the demanding print jobs. With the standard memory of 32 MB, it is quite fast than its predecessors. It features automatic document feeder that can only handle up to 50 sheets of paper at a time. It supports different media types such as envelopes, film/transparencies and plain paper. The printer is highly dependent on high-speed USB or parallel connectivity and cannot work as a standalone copier or scanner. With the use of HP Laserjet 3020 Toner Cartridges, the text quality comes through the printer is fine which is more than adequate for personal or office documents. It can also be used with Linux, UNIX, and MS-DOS operating systems. 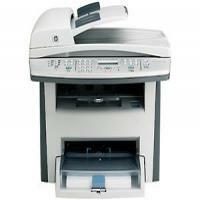 The HP LaserJet 3020 All-In-One is a good value and high-quality laser printer. Designed to efficiently print black-and white documents, it is suitable for average-volume printing with HP Laserjet 3020 Toner Cartridges. It comes with a copier and a scanner. But the colour printing function is not supported that is required to meet most of the demands now a days. Q. Does HP Laserjet 3020 printer has direct printing capabilities? A. No, This printer lacks wireless connectivity and direct printing capabilities, and cannot be integrated into a network. Q. What is the monthly duty cycle of HP Laserjet 3020 printer? A. The monthly duty cycle of this printer is 7,000 impressions. Q. How can I rely on the quality of compatible HP Laserjet 3020 Toner Cartridges that you are providing? A. The quality of the compatible Toner Cartridges are tested and verified by the experts and only then they are displayed on our site. Q. I want to cancel the order for the compatible HP Laserjet 3020 Toner Cartridges and place a new order for another product. How should I do it? A. You can cancel the order before the product is dispatched If in case the order has already been dispatched we will have to make some arrangements to cancel the shipping. After the cancellation of your order is confirmed only then you can place a fresh new order of any other product from our website. For more information please visit our page or contact us on 048 30833221 or email us on info@printerinkcartridges.ie. Q. Should I have to take some precautions to store the compatible HP Laserjet 3020 Toner Cartridges properly? A. Yes,some precaution to store the compatible Toner Cartridges are: 1.It should not be directly exposed to the sunlight. 2.The cartridge should not be kept openly.It should be intact with its original packaging otherwise it will lose its shelf life. Q. Is HP Laserjet 3020 printer a multi-functional device? A. Yes,The HP Laserjet 3020 is a multifunctional black and white printer with copying, printing and scanning capabilities.The printer is highly dependent on high-speed USB or parallel connectivity and cannot work as a standalone copier or scanner. With the use of HP Laserjet 3020 Toner Cartridges, the text quality comes through the printer is fine which is more than adequate for personal or office documents. It can also be used with Linux, UNIX, and MS-DOS operating systems. Q. Will my printer support wireless connectivity options? A. Unfortunately, the printer lacks wireless connectivity options, direct printing capabilities, and cannot be integrated into a network. Q. What if I got stuck in the middle of installing the software on my HP Laserjet 3020 printer? A. Remember we are just a phone call away to help and guide you on how to fix any sort of issue. You can also refer the online instruction manual before installing any software on your machine. Q. What happened if I am unavailable to take my order for HP Laserjet 3020 Toner Cartridges on time? Q. I want to buy the cartridges for my HP Laserjet 3020 printer. What extra charges do I need to pay? Do you offer cash on delivery? A. Once you have added the HP Laserjet 3020 Toner Cartridges to the cart and proceed to checkout, the list of services and taxes that you will be charged will be shown on your screen. You need to pay the shipping charges to the courier company that has made it possible to deliver your order on time. As for now, we do not offer cash on delivery so you can make the payments by using PayPal or your credit/debit card only. Q. Is your website secured? A. Absolutely, We have secured our website using the security features, which means that all data is secured. Also, When you purchase an item on this website the payment will be hosted by Sage Payments to ensure maximum security of your credit/debit card details. Q. Will I get the same number of printed pages from a compatible HP Laserjet 3020 Toner Cartridges as I get using the original cartridge? A. The compatible cartridges supplied on this site are passed through various testing procedures. So, you will get almost the same number of printed pages from the compatible cartridges as you will get from the original (OEM) cartridges.